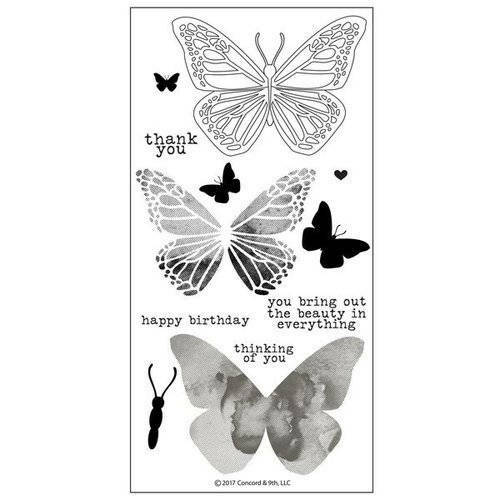 Spread your creative wings and create stunning visual details for cards, scrapbook pages, tags and more with the Butterfly Beauty Clear Acrylic Stamp Set by Concord 9th! The package contains 12 stamps that measure between .875" x .375" and 3.25" x 2.375". Achieve unique effects by coloring or painting the individual designs or layering them for variety. Use them with an acrylic block, your favorite inks and the Butterfly Card Die Set all sold separately for additional creative options. This set comes on a 4" x 8" handy storage sheet.